Has anyone had a problem with Creo manikin extension where manikin vision window sometimes shows wider FOV? Wider one seems to be peripheral vision of manikin. But there is no rule when it shows up instead of regular one except it usualy happens when more then one manikin in use in model. 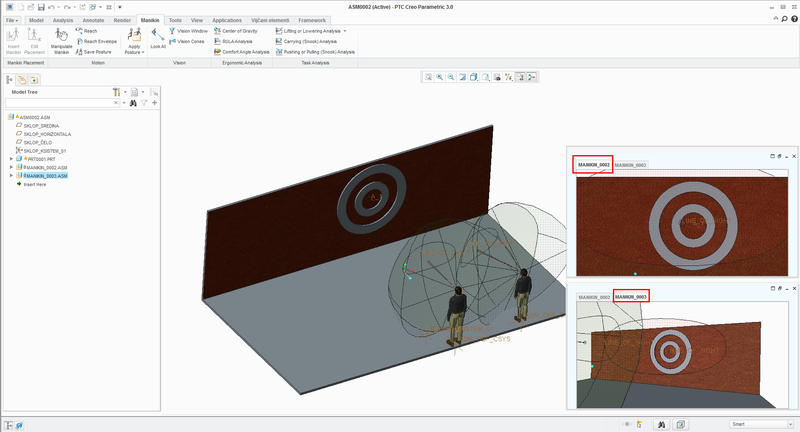 Yes, the option is hidden in the UI, but there is a published document: CS116969 : When Wildfire4.0 is compared with Creo Parametric 1.0, the vision range of "Vision Window" is different in manikin mode. (Creo Parametric). There was a difference in the vision range between Creo Elements/Pro 5.0 and Creo Parametric 1.0 - could it be related in some way? No I didnt use that setting. Its hidden option? Cant locate it with find. Actually sometimes I need periferal view from manikin to give my client screenshots of entire facility from certain viewpoint.They are planing to put cameras on certain places so they need to see what camera will see from those points to decide. Is there a way to set vision range or Field of view? I am working with creo parametric 2.0 and I would like to use a manikin to make a packaging note! My problem is that when I insert it in my assembly, the manikin has no surface.... it's transparent! I even downloaded one file found on grabcad and the manikin still transparent. only the shades can be seen with the option "NO HIDDEN". Does anyone know how to tune my settings, in order to see my manikin?